St. Louis Mosaic Project and the Woman’s Club of Washington University in St. Louis have teamed up to present the Women’s Connector Program, an opportunity for international women to connect with local women and activities. With a tradition of education, service and friendship, the Woman’s Club provides programs and activities for members throughout the year. 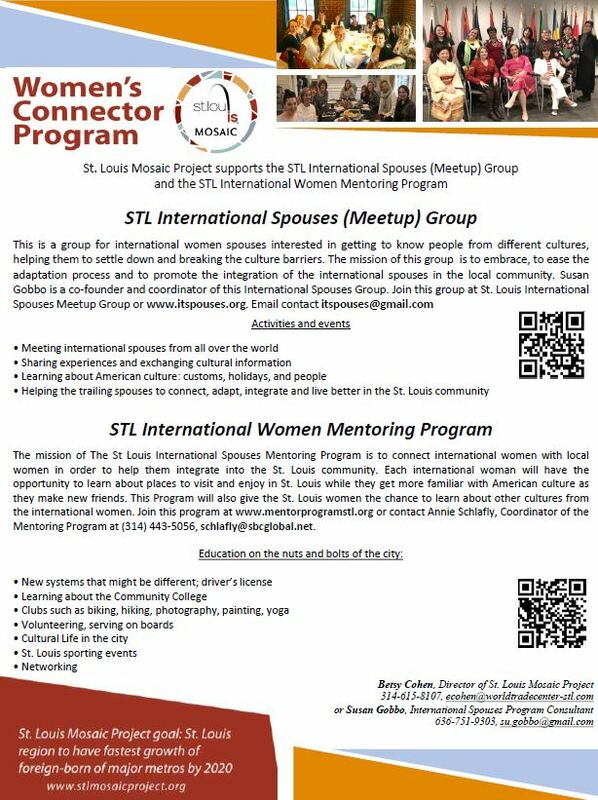 "The mission of The St Louis International Spouses Mentoring Program is to connect international spouses with local women in order to help them integrate into the St. Louis community. Each international woman will have the opportunity to learn about places to visit and enjoy in St. Louis while they get more familiar with American culture as they make new friends. This Program will also give the St. Louis women the chance to learn about other cultures from the international women. Our vision is to be a local resource to engage local women and International women, who will have the opportunity to learn about places to visit and explore in St. Louis while acclimating to American culture and traditions. The Program also gives local St. Louis women an opportunity to make new friends and learn about cultures from around the world."